A strong final quarter saw Dublin beat Mayo by 3-15 to 1-14 in Saturday's All-Ireland semi-final replay to progress to a second final in three years. 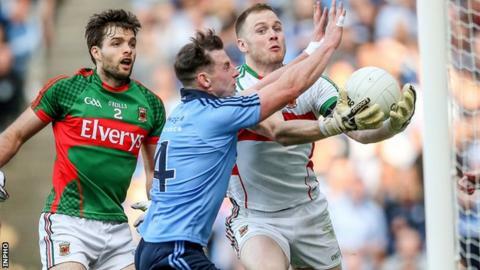 The sides were level seven times in the first half and it was 0-10 each at the break before Cillian O'Connor's 43rd minute goal put Mayo four points clear. Dublin hit 2-3 without reply in a 10 minute spell late on to take control. Bernard Brogan and Philly McMahon got the goals, with Kevin McManamon firing home a third for the 2013 champions. The sides drew a fiery encounter last Sunday with Diarmuid Connolly sent-off near the end, but the Dublin forward was cleared to play after winning his appeal to the Disputes Resolution Authority (DRA) on Friday night. Team-mate Paddy Andrews was the influential Dublin player in the first half, kicking four of his five points from play before the interval in a man-of-the-match display. Dublin outscored Mayo 3-5 to 0-2 in the final quarter to set up an All-Ireland final meeting with defending champions Kerry on 20 September. Mayo brothers Cillian and Diarmuid O'Connor were also influential in the opening half scoring six of the Connacht champions' points. Their midfielder Seamus O'Shea was black-carded early in the second half but Cillian O'Connor's close-range goal, after a strong run by veteran substitute Andy Moran, helped Mayo into a 1-12 to 0-11 lead after 53 minutes. They spurned several opportunities to go five points clear and Dublin seized on their uncertainty, reeling off a brilliant 2-3 between the 54th and 63rd minutes. Bernard Brogan slid in to drill home Dublin's opening goal after 55 minutes and 90 seconds later, Philly McMahon beat Mayo goalkeeper Rob Hennelly and fumbled the ball into the net. Points from James McCarthy, McMahon and Andrews pushed Dublin clear before McManamon added a spectacular third goal in the 66th minute. Dublin: S Cluxton; P McMahon (1-2), R O'Carroll, J Cooper; J McCarthy (0-1), C O'Sullivan, J McCaffrey; B Fenton (0-1), D Bastick; P Flynn, D Connolly, C Kilkenny (0-2); B Brogan (1-1), P Andrews (0-5), D Rock (0-2, 2f). Subs: MD Macauley for Bastick, M Fitzsimons for Cooper, A Brogan for Flynn, K McManamon (1-1) for Rock, E Lowndes for Connolly, J Small for B Brogan. Mayo: R Hennelly; K Higgins, G Cafferkey, C Barrett; D Vaughan, L Keegan (0-1), C Boyle; T Parsons, B Moran (0-1); D O'Connor (0-2), S O'Shea, K McLoughlin (0-1); J Doherty, C O'Connor (1-6, 5f), A O'Shea (0-1). Subs: P Durcan (0-1) for Vaughan, A Moran (0-1, 1f) for S O'Shea (black card), D Drake for Boyle, S Coen for Parsons, M Ronaldson for McLoughlin.